September 18, 2017 This post may contain affiliate links, which means that at no extra cost to you if you buy from one of the product links, I’ll earn a small commission which helps this site run. See full disclosure here. 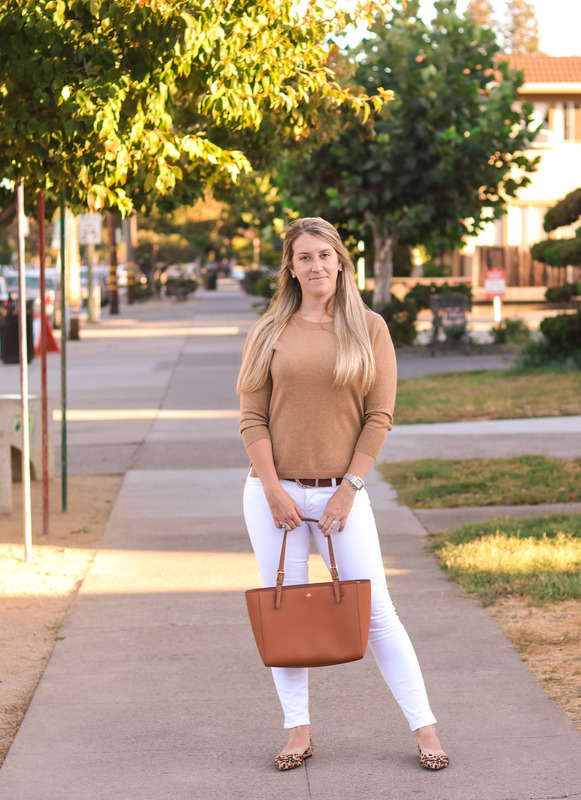 With temperatures still high in Northern California, it still feels like summer and it’s easy to continue wearing white after labor day.. White pants are one of my go to fashion pieces, and there’s no reason why we shouldn’t continue to wear white when it still feels like summer. Plus it’s always nice to get a little more wear out of your clothes! To transition your outfit from summer to fall, pair your white with fall colors, such as brown, black, burgundy, camel, or olive. You can easily create a fall vibe by adding some accent pieces in fall colors. 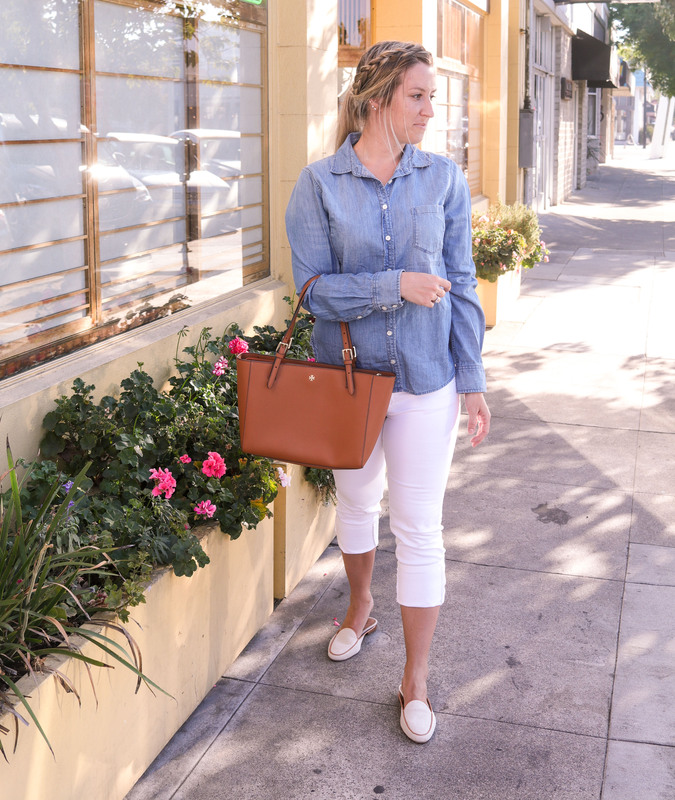 White jeans are one of my favorite wardrobe items, they really make your outfit so chic. Opt for a thicker denim to ditch the summer vibe. Pair white pants with fall colored tops, and as the temperatures drop add a blazer or denim jacket. Since it’s still pretty warm here in Northern California, this lightweight cashmere top from J. Crew is perfect without a jacket. White tops are always in style and can easily be worn under a cardigan or jacket. A white blouse can be worn with or without a jacket. And I absolutely love this Downtown Field Jacket by J. Crew that I got last year to wear over my white tops. It’s a great lightweight jacket that’s perfect for fall. For a bolder look, go with a white blazer over a black, gray, or camel colored top. When transitioning your outfits to fall, ditch the summer vibe by trading your sandals for a pair of flats, mules, or booties. These Sam Edelman booties (seen wearing here) are my favorite ankle booties; they instantly give your outfit a more fall vibe. Plus they’re just so chic and comfortable! A good pair of black booties are also essential for fall. Dress up your white pants, or even a white dress, with a pair of statement flats. I’m obsessing over these leopard print flats and these blush pink suede ones. And I’m loving my new mules. For a more casual outfit, grab a pair of classic white converse. Do you wear white after Labor Day? Thank you for subscribing! You've successfully signed up! I so wish i could rock a good white pants. Love these looks! I don’t own a single pair of white pants in any style. Going to have to change this from the looks of your styling picture. Yes Candy, you definitely need to get some! I think they’re so chic! I’m loving these outfits. I think people should wear whatever they want and the ones who complain about white after Labor Day are grandparents, I know mine did. Haha very true, and thank you Heather! I heard that rule from my parents and my aunts growing up so it’s just kind of stuck with me. I love all these outfits. I personally wear white all year long. Temperatures are still rather high in Texas too! White is just so fitting for warm weather! But it’s so chic in the fall and winter too! I’m ready for it to cool down some more. I have a pair of white pants and I love that I’m not the only one that we use them after Labor Day. I like the suggestions you have here. He looks stylish and casual all the same time. Thank you Jeanette! I feel like I’m one of my only friends to wear white at all (most of my friends are moms lol) so I’m definitely one of the only people to wear white after Labor Day. You are rocking that white and I lurve it! I rock my white slacks with boots during Fall and it’s a look that turns heads. 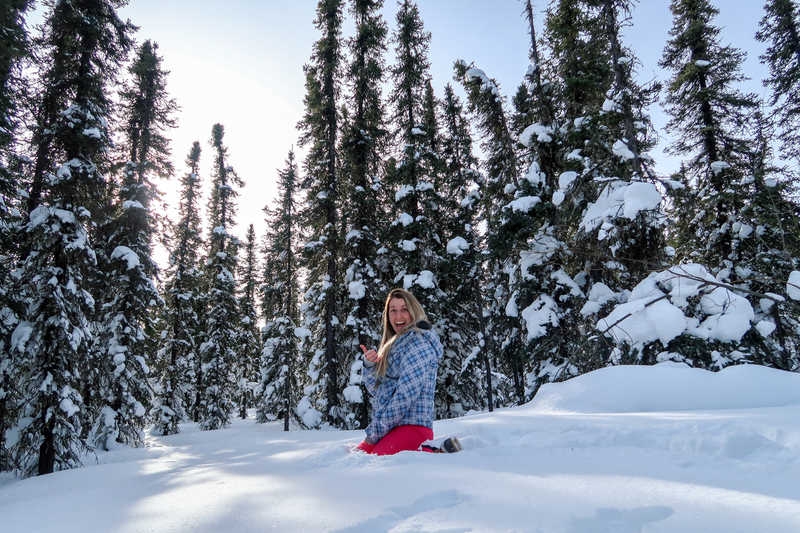 So many are hung up on the whole “No Wearing White After Labor Day” but not I.
I am loving how you are rocking the white – it looks absolutely amazing on you! These ideas are great! Love the outfits! I am a blue bluejeans person. I’m too accident prone to wear too much white. I do love the white capris. I wear them all the time. Nice. I’m not sure if I have ever lived by the rule not to wear white after Labor Day. These out fits look great on you. Pshhh, forget that silly rule. This all looks so good on you! Do you! Haha thank you Angie! I know it’s a silly rule (it’s 2017 and I can do what I want, right?!). But I just always grew up hearing it so I just kind of followed it! I love that first outfit with the tan sweater. Personally, I wear white year round and forget that fashion rule. These are great outfits for fall. I love to wear white in the fall and winter months. I love these mint colored Vineyard Vines pants. These are all great outfits! I really like the white pants with the denim button up shirt, really good combination. I am excited to stat wearing sweaters as it gets cooler! I’ve always been worried about wearing white after Labor Day but you make it look cool! Your outfit is great and you look wonderful! Loving the white pants, but not sure I could pull it off. I guess the first step is actually keeping those pants so clean! Looks like you are ready for fall, I would love to update my wardrobe with some of these pieces. All of those outfits are amazing and it totally suits you. Though I love the last one especially the top you wore. My Mom has always been a stickler for no white after Labor Day. But there is an actual winter white color now, and white tops are always ok. I absolutely love your style. I am all about wearing white after Labor Day, as long as it is paired with tasteful neutrals. Happy Fall!